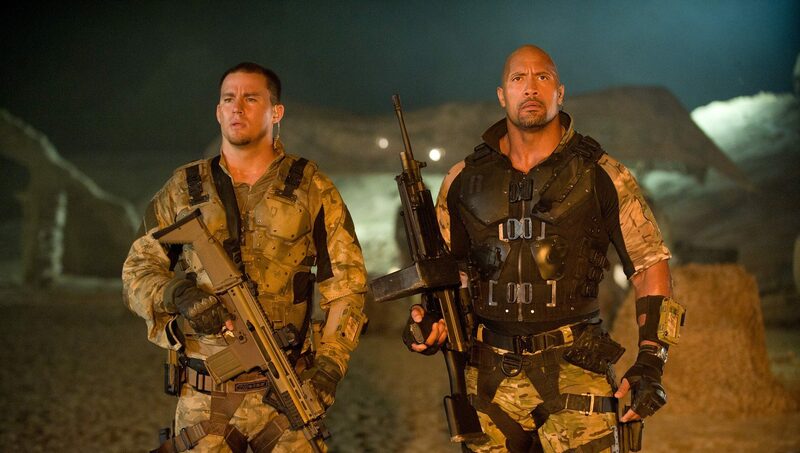 Magic Mike and The Rock to the rescue in ‘G.I. Joe: Retaliation’. At best, G.I. Joe: Retaliation is preferable to its predecessor, in the sense that a raging hangover is preferable to a case of the bubonic plague. Originally scheduled for release last June, it was reportedly pushed back nine months so that it could be converted to 3-D and so that extra footage of Channing Tatum could be filmed and added after test audiences reacted poorly to his limited appearance. While that may be true, there’s no denying that somebody had enough sense to realize that dropping this turd into a summer dominated by The Avengers and The Dark Knight Rises would have been disastrous. It’s nowhere near as daft and incoherent as G.I. Joe: The Rise of Cobra (2009), but its stripped-down generic-ness isn’t much of a trade-off. Based on Hasbro’s line of action figures and drawing from the scant mythology of the comic book and cartoon series it spawned in the 1980s, the movie informs us that Conrad “Duke” Hauser (Tatum) has assumed command of the elite strike team, then promptly [SPOILER ALERT, but not really since this was leaked last year] kills him off in the first reel, courtesy of a sneak attack arranged by the President of the United States (Jonathan Pryce, the only cast member who seems to be having any fun). The President is actually Zartan, a master of disguise working for the terrorist organization Cobra. While Zartan concerns himself with freeing Cobra Commander (Robert Baker) from prison and arranging a secret plot involving a nuclear arms summit, the surviving Joes — Roadblock (Dwayne Johnson), Flint (D.J. Cotrona), and Lady Jaye (Adrianne Palicki) go underground and seek help from the only man they can trust, founding team member General Joe Colton (Bruce Willis, going through the motions in between Looper and Red 2). Whereas Rise of Cobra director Stephen Sommers (The Mummy, The League of Extraordinary Gentlemen) tried to make the simplistic material cool via an excess of style, Retaliation director Jon M. Chu (Step Up 2: The Streets, Justin Bieber: Never Say Never) is content to strip the material down, but stops short of rebuilding it as something else. As to the wisdom of hiring a dance movie director to helm an action flick, the jury is out: The much-teased acrobatic alpine battle between Snake-Eyes and Jinx against a swarm of ninjas is energetic, impressive, and is the only scene that justifies the 3-D conversion; the rest of the movie seems drained of that energy, however. 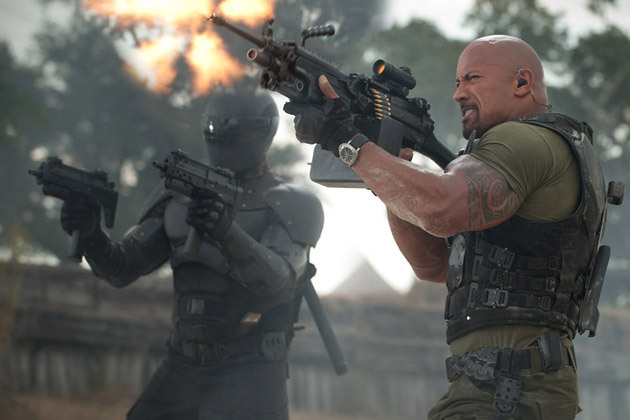 We’re handed a half-formed conventional action movie full of hardware, kung fu, gunplay, and ‘splosions, but short on memorable one-liners, creative action sequences, or engaging characters — a shame, since most of the fun of the G.I. Joe franchise lay in its exotic villains and far-fetched plots. It’s ostensibly a darker, grittier sequel, but fails to deliver on that since most of our heroes register as little more than blank spots on the screen. Johnson is practically a cartoon character himself, and his natural onscreen charisma overshadows a bland team. Even Willis seems too bored to care. We can relate.